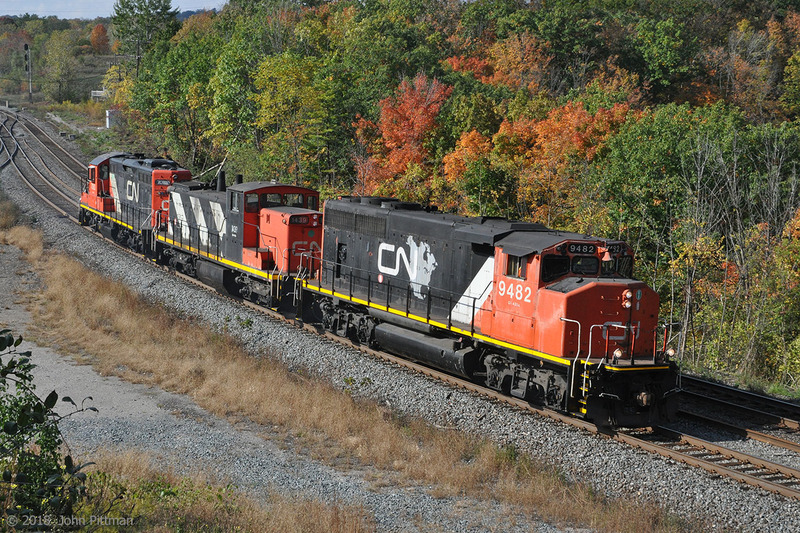 Railpictures.ca - John Pittman Photo: CN light power including middle GMD-1 CN 1439 are on a Sunday afternoon run at low mileage on the CN Dundas Sub, heading for Aldershot Yard where they would do some switching at the west end. The engines are near the bottom of the long downhill from Copetown. No dynamic brakes in this set – underframe haze was visible in prior pictures, and there was a smell of hot brakes after they had gone. | Railpictures.ca – Canadian Railway Photography – photographie ferroviaire Canadienne. Caption: CN light power including middle GMD-1 CN 1439 are on a Sunday afternoon run at low mileage on the CN Dundas Sub, heading for Aldershot Yard where they would do some switching at the west end. The engines are near the bottom of the long downhill from Copetown. No dynamic brakes in this set - underframe haze was visible in prior pictures, and there was a smell of hot brakes after they had gone. It will be a great stocking stuffer ! Phil, we’ll come up with a way to bottle that smell….and market it to railbuffs and ex employees. Ahh the good old days of stalling on Copetown Hill. 10 miles upgrade. Brake shoe smell. Oh man, I miss that smell. Pushed all the way to Paris!